I see Illustration Friday like a great world platform to show your work at same time as you see others work, and learn and get inspired with. For me, it is the way and occasion to develope and search the technique and method I feel better. Freedom, like childhood could be, like fairytales... like spring and summer and lavender air. Gorgeous! Her flowing hair and those translucent wings are just amazing. buenisimo! i love everything about it. This is so delicate and lovely! I love her face and wings! It makes me think of a lovely breezy day! How clever of you to combine these three influences!! I just love what you've done with 'breezy' - perfect! 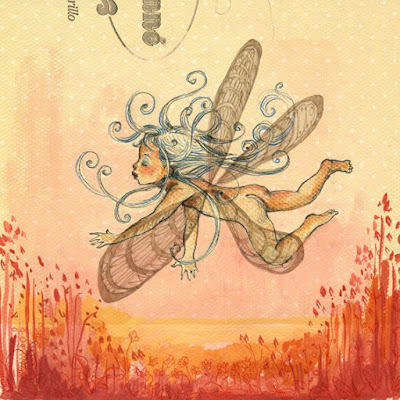 Love the delicate quality of the fairy! Gorgeous. Thank you all! Merci chouettes! Isa, me ha encantado tu comentario... me alegra mucho..Isa, isa...te conozco?? Beautiful, such wonderful colors and movement. Bravo!